Wi-Fi – Wi-Fi is abbreviation for Wireless Fidelity. Wi-Fi is a wireless technology that uses radio waves to provide High speed network connectivity and communication across devices based on the IEEE 802.11 standards. 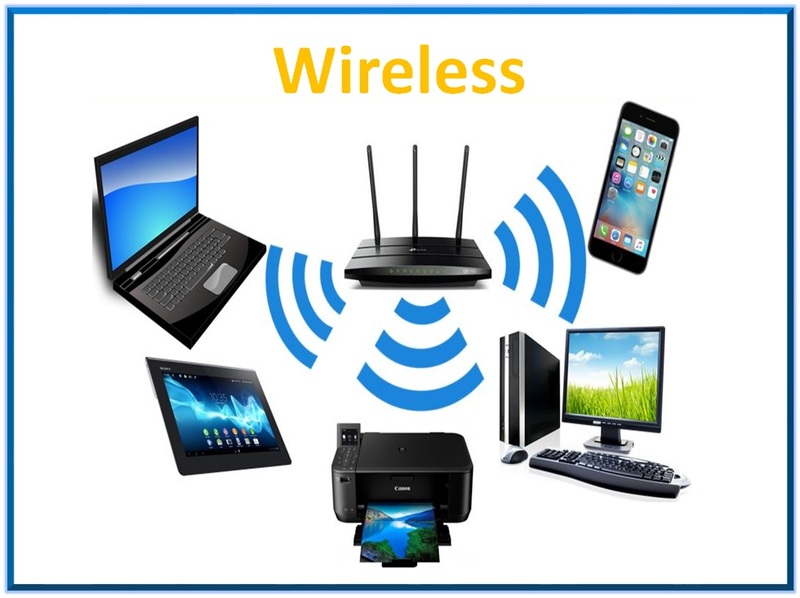 Devices that can use Wi-Fi technology include PCs/Laptops, video-game consoles, phones and tablets, digital cameras, smart TVs, digital audio players and modern printers. 802.11 – The IEEE committee and the set of standards maintained by the IEEE for wireless networking. 802.11a – The IEEE standard for wireless networking in the 5 GHz range. 802.11a devices can support up to 54 Mbps throughput. 802.11ac – The IEEE standard for wireless networking in the 5 GHz range. 802.11ac networks can support up to 1 Gbps throughput using multiple channels, 500 Mbps using a single channel. It will use 80 and 160 MHz channels and MIMO to achieve higher throughput rates. 802.11b – The IEEE standard for wireless networking in the 2.4 GHz range. 802.11b networks support up to 11 Mbps throughput and operate in the ISM band. 802.11g – The IEEE standard for wireless networking in the 2.4 GHz range. 802.11g networks support up to 54 Mbps throughput and operate in the ISM band. 802.11n – The IEEE standard for wireless networking that can use both the 2.4 GHz and 5 GHz ranges, with MIMO. 802.11n compatible access points and clients can support throughput rates of up to 600 Mbps, and clients are backwards compatible with older access points that can only do 802.11 a, b, or g.
802.1x – IEEE 802.1x is an IEEE standard for port-based network access control (PNAC).802.1X provides an authentication framework for wireless LANs, allowing a user to be authenticated by a central authority.). It is part of the IEEE 802.1 group of networking protocols. It provides an authentication mechanism to devices wishing to attach to a LAN or WLAN. Access Point (AP) – The network device that serves as an interface between wireless- enabled computers and the rest of the network. Using an Access Point as the network backbone, each computer connects first to the AP, then rest of Network. In simple words an AP acts as the bridge between wireless clients and the wired network. Wireless controller – Wireless controller (WLC) is used in combination with the Lightweight Access Point Protocol (LWAPP) to manage access points which are in large number. WLC makes the management and control of access points easy and simple to manage. Bridge – A device used to connect one network or device type to another, for instance wireless to wired. PCMCIA Card – PCMCIA stands for Personal Computer Memory Card International Association. It is the slide-in peripheral connector on most notebooks. WiMAX – WiMAX is abbreviation for Worldwide Interoperability for Microwave Access. It is referenced by IEEE 802.16. WiMAX is also commonly termed 4G network.WiMAX is used as wide area network for providing access between various wireless devices. WiMAX uses OFDM modulation scheme. Piggybacking – Piggybacking on internet access is the way of establishing a wireless connection by using another subscriber’s connection without the person’s permission or knowledge. Piggybacking is an unauthorized tapping into another’s connection with a public utility. IBSS – IBSS is abbreviation for “Independent Basic Service Set”. IBSS allows 2 or more devices to communicate directly with each other without a need for a central device. BSS – Abbreviation for “Basic Service Set”. BSS wireless LAN is established using a central device called an Access Point that centralizes access and control over a group of wireless devices. ESS – Abbreviation for Extended Service Set, ESS is created by connecting multiple Basic Service Set (BSS) via a distribution system. 2 or more Access Points are connected to the same Local Area Network to provide a larger coverage area which allows the client to move from one AP to another AP and still be the part of the LAN. An ESS generally includes a common SSID to allow roaming from access point to access point without requiring client re-configuration. WEP – Abbreviation for Wired Equivalent Privacy, WEP provides basic wireless security. WEP is available in 40-bit (also called 64-bit), or in 108-bit (also called 128-bit) encryption modes. As 108-bit encryption provides a longer algorithm that takes longer to decode, it can provide better security than basic 40-bit (64-bit) encryption. SSID – Abbreviation for Service Set Identifier ,SSID identifies a wireless network. The identifier is attached to the wireless local area network (WLAN) and acts as an identifier when a device tries to connect to the system. A device will not be permitted to join the network unless it can provide the unique SSID. An SSID can be broadcast by the network router, allowing devices to detect it as an available network. An SSID does not supply security to the network. Hotspot – A Wi-Fi hotspot is a physical location where people may obtain Internet access, via a wireless local area network (WLAN) using a router connected to an internet service provider. Public hotspots may be created by a business for use by customers, such as coffee shops or hotels, airports etc. Dual-band – Wireless routers that offer both 2.4 GHz and 5.0 GHz ranges are called a dual-band.